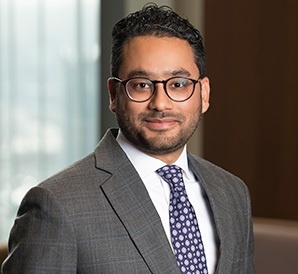 Abdul focuses his practice on capital raising transactions, mergers and acquisitions, securities, and general corporate matters. Before joining the Firm, Abdul was an associate in the corporate group at a large national law firm in New York. He has project experience with Islamic finance and is fluent in Urdu and proficient in Arabic. During law school, Abdul served as a judicial intern for the Honorable Martin C. Ashman, U.S. District Court for the Northern District of Illinois. Prior to law school, he worked in the corporate departments of a major international energy company as well as a manufacturing firm in Houston, TX. Represented CNB Bank Shares, Inc. in connection with its acquisition of Jacksonville Bancorp, Inc. (Nasdaq: JXSB). Midland States Bancorp, Inc. (Nasdaq: MSBI) Acquires Alpine Bancorporation, Inc. Represented Midland States Bancorp, Inc. (Nasdaq: MSBI) in connection with its acquisition of Alpine Bancorporation, Inc. Represented QCR Holdings, Inc. (Nasdaq: QCRH) in connection with its acquisition of Bates Financial Advisors, Inc., Bates Financial Services, Inc., Bates Securities, Inc., and Bates Financial Group, Inc. Represented American Enterprise Bank in entering into a definitive agreement with Northbrook Bank & Trust Company, a subsidiary of Wintrust Financial Corporation (Nasdaq: WTFC), in which Northbrook Bank & Trust Company acquires certain assets and assumes certain liabilities of American Enterprise Bank.